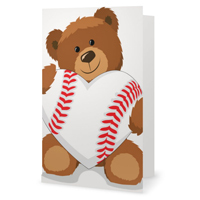 Treat that special baseball fan in your life with a gift that expresses their love for the game. Each petal of the Baseball Rose is carefully handmade from genuine baseball leather to form an unforgettable bloom that will amaze the baseball fan in your life. The Baseball Rose requires no watering and will never wilt or die. The artificial stem measures 24" in length and has a "life-like" quality that is hard to distinguish from live stems when arranged in a mixed bouquet with live roses. Baseball Roses look their best when displayed in a vase arrangement at home, in the office, dorm, or man cave. 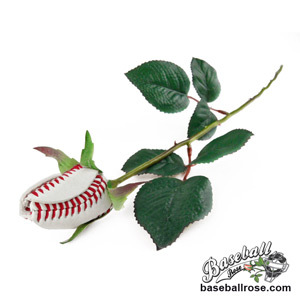 Baseball Roses are a great gift for all occasions - birthdays, graduations, tournaments, award ceremonies, senior night, or just to say thank you to a dedicated volunteer in your league. 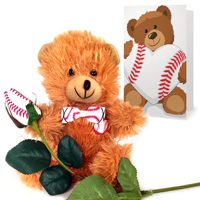 Baseball Roses can be given to both men and women - players, coaches, parents, and team moms. 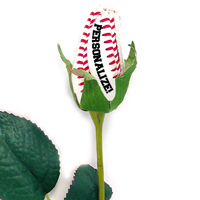 Petal Personalization Service: We can add short permanent message on the petals of the Baseball Rose. 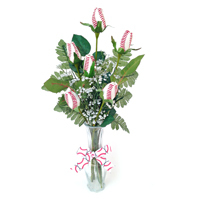 Click Here to order Personalized Baseball Roses This is a great way to commemorate a special occasion like a player number, birthday, wedding date, tournament name, or special achievement. Mix & Matching with other standard Sports Roses styles is allowed. Discounts are automatically applied online and based on regular retail price of standard display option ($17.95). Additional charges apply to premium display options and petal personalization service. *ALL SALES ARE FINAL on personalized Sports Roses. View our return policy here. From CIndy Kowalczyk of Blue Island, Illinois on 7/19/2017 . The long stem roses are being handed out to the ladies in the wedding party....Beautiful idea! . . .
From Janet Johnson of Bloomington, Minnesota on 5/29/2017 . we got what we needed when we needed . . .
From Jeff Nesvara of Grand Island, Nebraska on 5/27/2017 . One word AWESOME!! From ordering to adding more and still got them on time. The moms simply . 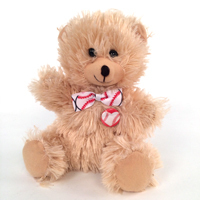 . .
A great gift for baseball mothers!!! From Arturo A Hernandez of Mercedes, Texas on 5/4/2017 . Thank you very much,everybody loved the sport roses during our parents night. From Jenny of Toronto, Ontario on 2/16/2017 . These are absolutely awesome! I got them for my boyfriend and he loved them! He couldn't believe . . . Response From Sports Roses: No. The stem used on our Sports Roses is not real (live). We use an artificial stem similar to what you would find on a silk rose. It looks real, but no watering is required.